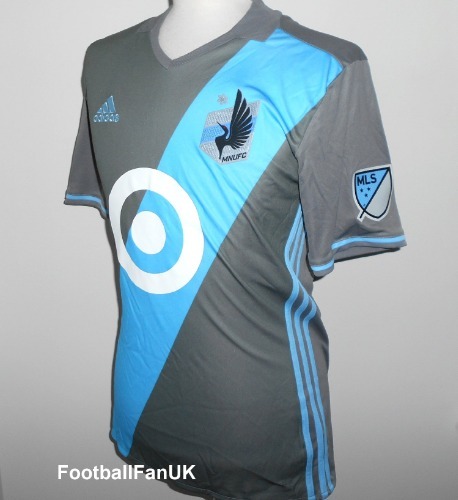 This is the 2017 season official men's authentic player issue home soccer jersey of MLS team debutants Minnesota United FC. 2017 was the inaugural season for the team in the MLS and although they could only finish 9th in the Western Conference, their avarage attendance of 20,538 bodes well for the future of the club. It is an official Adidas product, new with tags. This is the commercial authentic player issue version of the jersey with Adizero technology and heat pressed club badge and MLS sleeve patches. - Heat pressed club badge. - Heat pressed MLS sleeve patches. - Grey with light blue sash and trim. - Adidas product code AY1761. - New with tags with MLS authenticity hologram and individual serial number. - DESIGNED TO BE A SLIGHTLY SLIMMER FIT THAN REGULAR ADIDAS JERSEYS. - Adult Size Small. Chest 36", length 28". - Adult Size Medium. Chest 39", length 29". - Adult Size Large. Chest 42", length 29". - Adult Size XXL. Chest 49", length 32".